Aussie Meat Pie made of diced meat, mushroom and onion covered with our heavenly gravy. Chicken & Vegetable Pie with chicken, peas, corn & carrots mixed together & completed with a creamy white sauce. Steak & Onion pie made of stewed Angus tenderloin steak & caramelized onion in a crispy puffed pastry pie. 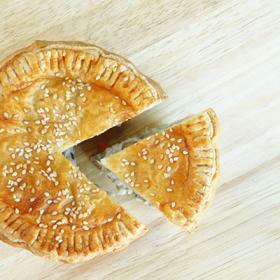 Pies are available to grab 'n go as a snack or to enjoy them, warm and comforting, @ Sage and Sirloin.